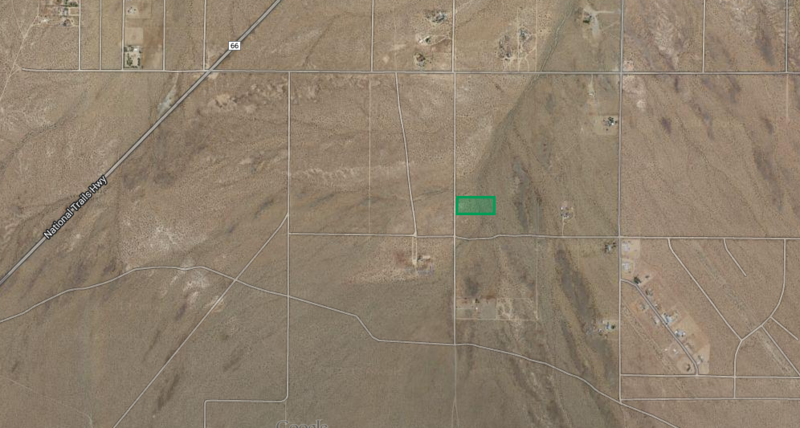 This property for sale in Helendale is just under a mile from National Trails Highway, better known as Route 66. A town of 6,000 residents in the largest county in California, San Bernardino, Helendale is mostly known for a Home Owners Association called Silver Lakes. The HOA has two lakes, a championship 27 hole golf course, an equestrian center, and beautiful parks. Directions to the property from Victorville: travel north on Interstate 15 and take the D Street exit turning left which becomes National Trails Highway (Route 66). Travel 18.6 miles and turn east onto Bonanza Trail, go .7 miles and turn south onto Sunset Trail. Sunset Trail is marked with a street sign, and you will also see a LandCore sign pointing the way. 3/10 of a mile down Sunset Trail is the northern corner of the property marked with a white pole topped with pink ribbon and paint as are the approximate location of all the corners of the property. This piece of ground is nestled just over the hill on Sunrise Trail hiding it from the main highway. It has a very small, natural drainage running through one end of the property. There are beautiful morning views of desert mountains to the East, hence the name Sunrise Trail and to the south there are closer, nearby mountains. A quarter of a mile to the east is a small neighborhood of 11 newer, modular homes characterized with white ranch fencing. There are currently only three other homes whose main access is Sunset Trail. The owner of this property is willing to carry the financing! The terms at the time of this blog posting are $3,000 down (20%), a loan amount of $12,000 amortized at 6% interest for 10 years. Your monthly payment is approx $133 per month or more until paid. Are you a land owner? Consider getting this free report if you are thinking of selling your property.